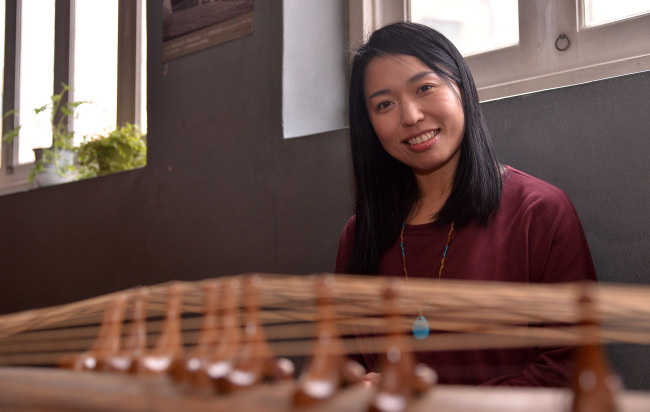 Ever since musician Jung Mina started learning to play the gayageum, a traditional Korean string instrument, at 12 years old, she knew then it would play a significant role in her life and career. With the aspiration of using the sounds of the gayageum with a modern-day twist, Jung differentiates herself from other classical gayageum players as well as solo folk singers by pairing her voice with the non-traditional techniques of playing while singing contemporary music. “I think it’s obvious that one of the biggest things that sets me apart from other singers is that I sing along while playing the gayageum, but honestly, I don’t really consider my music that different from mainstream folk music,” said Jung during an interview with The Korea Herald at the C Cloud music cafe in Hapjeong-dong, Seoul. After making her professional music career debut in 2005 with her first EP “Tragedy,” Jung ― who has been working on her latest 10-track album “A Person’s Moment” for the past two years ― finally released her fourth studio album at the end of last month. Convinced that visiting another library and browsing through various books would help her keep her creative juices flowing, Jung decided to embark on a weeklong library tour across the country on her own. Jung will showcase the tracks from her newly released album during a live show at the Hakchon Blue Small Theatre in Seoul on March 8.